This page aims at bringing some elements to better address this question. Light streaks are a visual symptoms characterized by the perception by the eye of a bright straight line emanating from either side of a bright light source. Unlike circular halos or glare, the spreading of the perceived light spread is straight, and always oriented in the same direction. The mechanism behind this visual symptom is a phenomenon of diffraction of the incident light by a fine structure which is oriented, and can be unique or repeated. Light streaks belong to the general group of unwanted visual phenomena called « dysphotopsias« . Dirty deposits on the glass of windows or windshields can commonly give rise to this kind of phenomenon. It is easy to reproduce by simply leaving a fatty drag on a transparent surface: smearing your finger on a window or a spectacle lens suffices to cause the diffraction of light by the tiny linear deposits at the surface of the glass. Observing an incoming light source through some dirty linear deposits or scratches on a transparent surface, can clearly render characteristic light streaks, which are always perpendicular to the main axis of or scratches. After taking a night photo by a clean smartphone (left), the following photographs (right) were obtained by leaving voluntarily, with the pulp of a finger, some dirt trails on the front optic glass window of a smartphone. The orientation of the bright streaks that are visible around bright light sources in the photographs, is perpendicular to the main direction of the dirt spread on the glass surface. When the direction of the light streak varies with the orientation of the patient’s head, the phenomenon is so-called « entoptic ». It arises from one of the optical structures of the affected eye (cornea, or intraocular lens in the vast majority of cases). – The folds of the posterior capsule after cataract surgery and replacement of the opaque crystalline lens with an intraocular lens (IOL). A marked line scratch of the optic of the IOL can also cause the perception of some light streak (s). – The macro-folds formed by the partial displacement of a LASIK flap, because these folds are usually grossly parallel. Here is the drawing provided by a patient which perceived oblique light streaks around bright light sources immediately after cataract surgery of his right eye. Ophthalmic examination at the slit lamp revealed the presence of a unique marked posterior capsular fold. Depiction by a patient of the light streaks around vehicle lights, which were noticed immediately after uncomplicated cataract surgery. Slit lamp examination revealed the presence of a vertical capsular fold in the nasal portion of the pupil. Représentation par un patient des stries lumineuses perçues autour des phares de véhicules au décours immédiat d’une chirurgie de la cataracte. A l’examen à la lampe à fente, on note la présence d’un pli capsulaire postérieur dans la portion nasale de l’aire pupillaire. The orientation of this fold was consistent with the perceived light phenomenon, but this appreciation requires the « vertical inversion » of the apparent direction of the capsular fold, to reflect the orientation of the patient’s retina vis-à-vis of that fold . The orientation of the light streak is indeed perpendicular to the fold in a landmark oriented from the retina of the subject, and not from that of the examiner (note the perfect orthogonality of the patient’s perceived light streak and the fold as seen from the retina). L’orientation des stries lumineuses est perpendiculaire à celle du pli, à condition de considérer l’orientation de celui-ci comme « vu depuis la rétine ». Noter l’orientation parfaitement perpendiculaire entre la direction de la strie lumineuse et le pli capsulaire vu depuis la rétine. 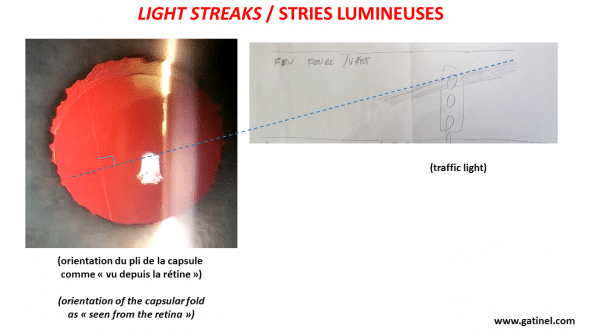 The optical phenomenon involved in the genesis of luminous streaks is related to the diffraction of light by the rectilinear folds (posterior capsule, LASIK flap, scratch of the IOL’s optic, etc.). The dimensions (scale) of the diffracting object (i.e. the capsular fold) are of the same global scale of the wavelengths of visible light (micron scale). According to the Huygens principle, the fold of the capsular bag may act as a secondary source of light waves. (According to Huygens’ principle every point on a wave front of light can be considered to be a secondary source of spherical wavelets). The fold causes a local disturbance to the path of the incoming wavefront, which explains the lateral spread in the vicinity of the fold. En vertu du principe de Huygens, chacun des points situés sur le trajet d’un front d’onde lumineux re émet des ondes dans toutes les directions. Par sommation, le front d’onde se propage vers l’avant. Un obstacle comme le pli crée une diffraction lumineuse latérale et explique la perception visuelle de l’étalement lumineux perpendiculaire à la direction du pli. A classic experiment in Optics is to study the diffraction of light waves emitted by a monochromatic source (eg laser pointer) by a thin thread, or a hair, which have thickness of several tens of microns. When a thin wire intercepts the laser light, a diffraction phenomenon is generated. It can be displayed on a screen which will feature typical bands of light (from the measurement of the angular width of the central luminous line, one can determine the thickness of the wire used for the experiment). Typical pattern of diffraction of a laser source (red pointer) by a human hair. The hair is oriented vertically. Pattern de diffraction par un cheveu d’une source laser rouge (pointeur). Le cheveu est orienté verticalement. In physiological optics, light sources perceived by the eye in everyday life are polychromatic and non-coherent; more simply, the light waves they emit are less organized (synchronous in time and space) than a laser source. Therefore, the lateral light spreading generated by the diffraction of the waves is less uniform, because the constructive and destructive interference are much less systematized. Nevertheless, the direction of this light spreading corresponds to that inflicted by the diffractive structure of rectilinear geometry to the flow of incident light waves, and are mutually orthogonal. The fold is located on the path of the light refracted by the cornea and the IOL The lateral diffraction band is focused onto the retina as a straight line, which is strictly perpendicular to the fold. 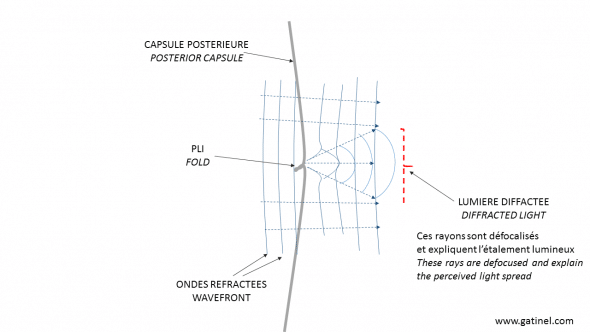 Le pli capsulaire est interposé sur le trajet de la lumière réfractée par la cornée puis l’implant intraoculaire. L’image formée dans le plan rétinien est un étalement lumineux strictement perpendiculaire au pli capsulaire. Some patients also perceive fine iridescent or colored side fringes “as a rainbow” at the edges of a central light streak emitted by intense white light source, such as a flash-lamp. This colorful spread reflects the sensitivity of the diffractive phenomenon to the wavelength of the light radiation into play, and echoes the intimate wave mechanism of the optical phenomenon involved in the appearance of the disturbing bright light streaks. Beside careful slit lamp examination, there are no investigationnal tool which can enable to objectivate the effect on the ocular wavefront of local light path disturbances. Shack Hartman aberrometers are not conceived to highlight and resolve local scatter and diffraction sources within the eye. However, double pass instruments (eg OQAS, HD-Analyzer) may help to quantify the scatter incured by marked LASIK flap flods. The treatment of annoying bright streaks depends on the their cause: smoothing the flap folds in case of complicated LASIK, or perform a YAG laser capsulotomy in case of symptomatic capsular folds. These maneuvers are generally effective and lead to the disappearance or high attenuation of these light streaks. Choi CJ, Melki SA. Maddox rod effect to confirm the visual significance of laser in situ keratomileusis flap striae. J Cataract Refract Surg. 2011;37(10):1748-50. Holladay JT, Bishop JE, Lewis JW. Diagnosis and treatment of mysterious light streaks seen by patients following extracapsular cataract extraction. J Am Intraocul Implant Soc. 1985 ;11(1):21-3. Cette page vis à apporter des éléments de réponse à ce type de complaintes visuelles. La ou les strie(s) lumineuse(s) (« light streaks ») correspondent à un symptôme visuel caractérisé par la perception par l’œil d’un « trait lumineux », d’une « bavure rectiligne », d’une sorte « d’élongation lumineuse », émanant de part et d’autre d’une source de lumière vive. Les stries lumineuses sont un type de sensation visuelle indésirables parfois ressenti après chirurgie de la cataracte (dysphotopsie). A la différence des halos circulaires, l’étalement lumineux est rectiligne est toujours orienté dans la même direction. Le mécanisme à l’origine de celui-ci est un phénomène de diffraction de la lumière incidente par une structure fine orientée, unique ou répétée. Les trainées de salissure sur les vitres ou les parebrises de véhicule qui peuvent couramment donner naissance à ce genre de phénomène qu’il est facile de reproduire: il suffit par exemple de laisser une trainée grasse sur une surface transparente, en passant par exemple le doigt sur une vitre, ou un verre de lunette. En observant ensuite une source lumineuse au travers de la surface salie ou rayée, on perçoit distinctement l’étalement lumineux caractéristique, qui est toujours orienté perpendiculairement à l’axe principal de la ou les rayures. (voir illustration plus haut). Après la prise d’une photo nocturne de référence par l’optique (propre) d’un smartphone (à gauche), les photographies suivantes (à droite) ont été obtenues en laissant volontairement, avec la pulpe d’un doigt, une trainée grasse sur l’optique avant du smartphone. L’orientation des stries lumineuses, qui sont bien visibles autour des sources de lumière vive sur les clichés, est à chaque fois perpendiculaire à la direction principale de l’étalement de la trainée sale à la surface de l’optique. 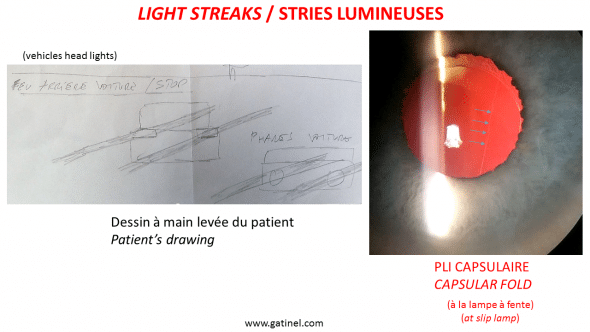 Quand la direction de la strie lumineuse varie avec l’orientation de la tête du patient, le phénomène est alors qualifié d’« entoptique ». Il émane directement de l’une des structures optiques de l’œil concerné (la cornée ou l’implant de cristallin artificiel), et non d’un élément extérieur à celui-ci. Les plis de la capsule postérieure après chirurgie de la cataracte et pose d’un implant de cristallin artificiel. Une rayure marquée de l’optique de l’implant peut également provoquer la perception de strie(s) lumineuses. 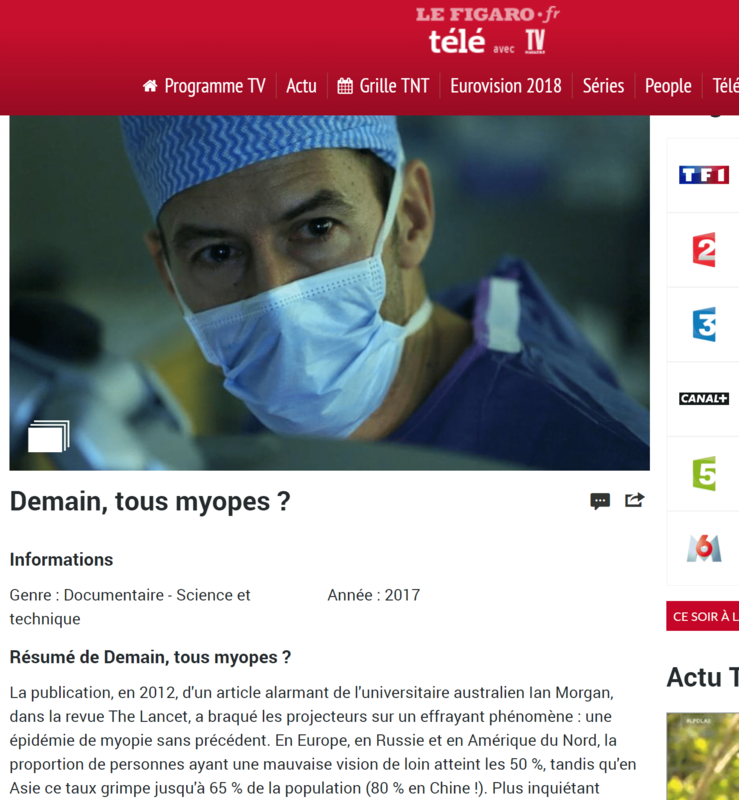 Les macroplis formés par le déplacement partiel d’un capot de LASIK, car ces plis sont généralement orientés de manière parallèle. Voici le dessin fourni par un patient ayant perçu, au décours immédiat d’une chirurgie de la cataracte, des stries lumineuses obliques, autour des sources de lumière vive de son environnement quotidien. L’examen à la lampe à fente a révélé la présence d’un pli capsulaire postérieur assez marqué. L’orientation de celui-ci est conforme à celle du phénomène perçu,… à condition « d’inverser verticalement » la direction du pli capsulaire pour se placer dans la même orientation que la rétine du patient vis-à-vis de celui-ci. 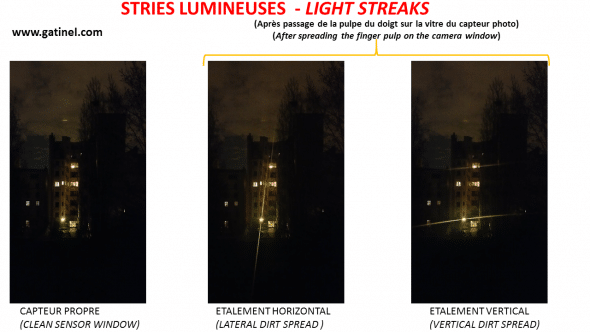 L’orientation de la strie lumineuse est en effet perpendiculaire à celle des plis, dans un repère orienté depuis la rétine du sujet, et non celui de l’examinateur. 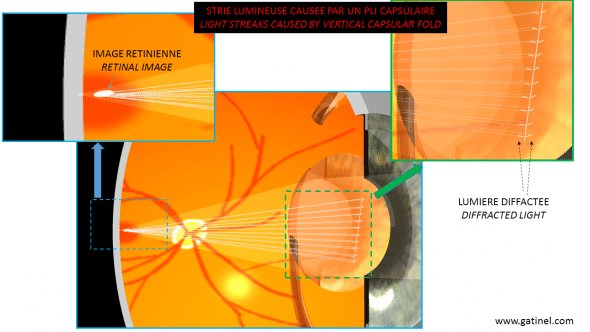 Le phénomène optique mis en jeu pour la genèse des stries lumineuses est lié à la diffraction de la lumière par le ou les plis rectilignes (capsule postérieure, capot de LASIK, rayure d’un implant, etc.). Les dimensions de l’objet diffractant (ici le pli capsulaire) sont voisines des longueurs d’onde de la lumière visible (microns). (voir illustration plus haut) Une expérience classique en optique expérimentale consiste à étudier la diffraction des ondes lumineuses émises par une source monochromatique (ex : pointeur laser) par un fil, ou un cheveu dont l’épaisseur est de quelques dizaines de microns. 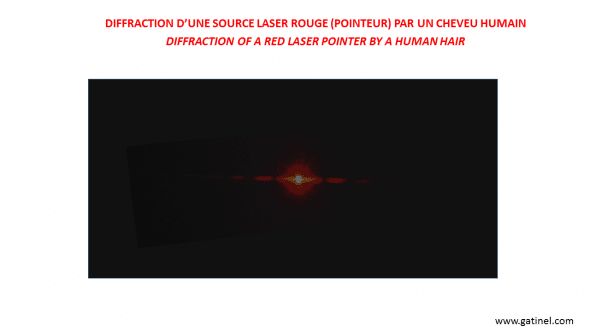 Quand le fil intercepte la lumière laser, un phénomène de diffraction est engendré et peut être visualisé sur un écran par une image caractéristique qui compote un trait principal lumineux perpendiculaire à l’axe du fil, accompagné de raies plus périphériques séparées par des intervalles sombres. A partir de la mesure de la largeur angulaire du trait lumineux central, on peut déterminer l’épaisseur du fil utilisé pour l’expérience. En optique physiologique, les sources lumineuses perçues par l’œil dans la vie courante sont polychromatique et non-cohérentes ; plus simplement, les ondes lumineuses qu’elles émettent sont moins synchrones ou organisées dans le temps et dans l’espace que celles d’une source laser. De ce fait, l’étalement lumineux latéral engendré par la diffraction de ces ondes est moins régulier, car les interférences constructives et destructives sont beaucoup moins systématisées. Néanmoins, la direction de cet étalement lumineux correspond bien à celle qu’inflige au flux des ondes lumineuses incidentes la structure diffractive de géométrie rectiligne. Certains patients perçoivent d’ailleurs de fines franges latérales irisées ou colorées comme un arc en ciel aux bords de la strie lumineuse centrale émise par une source intense de lumière blanche, comme une lampe-flash. Cet étalement coloré reflète la sensibilité du phénomène diffractif à longueur d’onde de la radiation lumineuse mise en jeu, et illustre le mécanisme intimement ondulatoire du phénomène optique impliqué dans l’apparition des stries lumineuses. Les moyens d’investigations objectifs sont limités pour étudier objectivement l’effet des plis sur le front d’onde oculaire. Les aberromètres de type Shack Hartman ne sont pas conçus pour mettre en évidence les effets produits par des anomalies localisées au sein des structures oculaires comme les plis (de capot, ou de capsule). Toutefois, les systèmes par double-passage (OQAS, HD-Analyer) peuvent s’avérer utiles pour quantifier la diffusion lumineuse induite par des plis de capot prononcés. Le traitement des stries lumineuses gênantes dépend de la cause de celles-ci : il faut déplisser le capot en cas de LASIK compliqué, ou réaliser une capsulotomie au laser YAG en cas de plis capsulaires symptomatiques. Ces manœuvres sont généralement efficaces et conduisent à la disparition ou la forte atténuation de ces stries.